buy now Sharpen your skills to be a change-maker. It takes leadership to rally a community, solve tough challenges and create change. 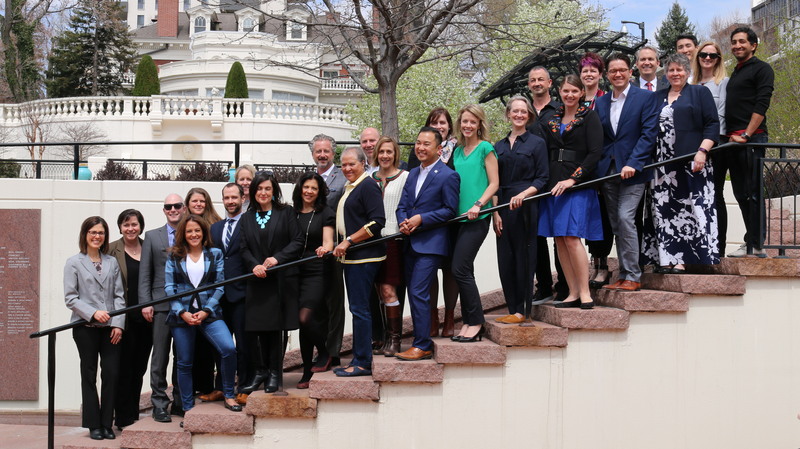 Colorado’s Civic DNA Fellows, the Denver Metro Chamber Leadership Foundation’s newest offering helps leaders with a deep commitment to our community to further develop their leadership skills so they can increase their business and civic impact. website Applications for Colorado’s Civic DNA Fellows are closed. Join the interest list to learn more about this program. Colorado’s Civic DNA Fellows runs April to December 2019. Applications for Colorado’s Civic DNA Fellows are closed. buy now Pricing: Tuition is $4,900. With all of the Leadership Foundation’s programs, we are committed to building a class that reflects a diverse community of leaders. Scholarship opportunities will be made available. cheap generic viagra mail order pharmacy How is Colorado’s Civic DNA Fellows different from other Denver Metro Chamber Leadership Foundation programs, like Leadership Denver? Colorado’s Civic DNA Fellows takes a different approach by focusing first on building leadership skills rather than looking at issues. These advanced leadership skills are designed to help participants increase their effectiveness as leaders in their work and in the community. Over the eight months of the program, participants will have access to unique, personalized tools to grow their leadership capabilities—including 360-degree feedback, one-on-one professional coaching and peer coaching—all based on the values of Colorado’s Civic DNA. What will an average day during Colorado’s Civic DNA Fellows look like? The program will run from April to November, with group meetings for a full day each month. Our learning approach will be highly interactive, with innovative exercises, explorations and discussions including time for practice and reflection. There will also be a retreat to help build relationships and deepen engagement. 2019 program dates: April 12, May 16-17, June 21, July 19, Aug. 16, Sept. 20, Oct. 18 and Nov. 15. Do I have to be an alumni of another leadership program to apply? No, you do not. While experience in a leadership program is helpful to ensure you have a strong foundation in current Denver metro area issues, it is not required. During the application process, we will look to understand your knowledge of community issues and how you have already taken action in the community in areas you’re passionate about. What does the application process for Colorado’s Civic DNA Fellows look like? Applications will open in October 2018. A written application must be submitted by Monday, Feb. 4. All applicants must also attend an in-person interview. If you would like to be notified of the application opening and other important updates related to Colorado’s Civic DNA Fellows, visit denverleadership.org/fellows and select the option to be added to our interest list. Do I have to be a member of the Denver Metro Chamber of Commerce to participate? No, you do not. Program tuition is $4,900. Partial scholarships are available. Our goal in every Leadership Foundation program is for you to gain the knowledge, network, skills and experience to enhance your impact in the community. How you work matters as much as what you do, which is why our community values—Colorado’s Civic DNA—are at the core of this program. Colorado’s Civic DNA Fellows should be committed to personal growth and have a strong understanding of current community challenges as part of this class.